Indian Man has survived 70 years without food & water – Miracle or Myth ? Okay, this is not something related to business, but quite unusual and thought I should share it with our readers. This could really be termed as a miracle – An Indian Yogi named as Pralhad Jani claims that he has not had food or water for 70 years. He is now 82 years old and quite healthy. Although, the claim for not eating or drinking for 70 years is unsubstantiated, he has been kept in one of the Indian hospitals to study how he can do that. He has been in hospital for past 8 days and has not touched water or food and appears to be in great health. Pralhad Jani claims to have been blessed by a goddess when he was 8-years-old, which has enabled him to survive without sustenance and that he derives energy through meditation. If you are not aware, there are many people can live without food for several weeks, with the body drawing on its fat and protein stores. But the average human can survive for only three to four days without water. So what’s your opinion? do you really think he could have survived without food & water for over 70 years? 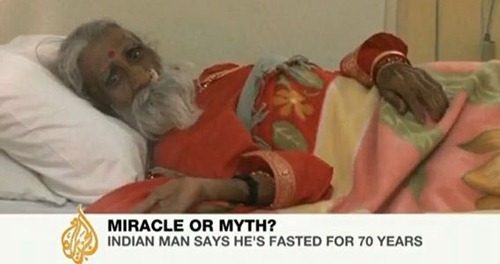 "Indian Man has survived 70 years without food & water – Miracle or Myth ? ", 5 out of 5 based on 1 ratings. WOW ! A Windows Netbook for Rs. 7999 only ! If this is true can he teach us? If yes then the starvation in India will be eradicated. I will ever believe it. even if u are a religious fanatic like ASHIKA here, it is not hard to accept science proofs of this (experiment) and screaming around it is against the law of physics! ain’t too bright. cuz there is no such thing like “against the law of physics!” physics are unchanged from the beginning, only we have not explored evan 1% of it especially our brain abilities. Yes. Our world is full of surprises. It’s Great to say we are INDIAN, but we see our indian only consume lots of food and waste food, if each and every person do meditation “PIRAMID MEDATION”. in this no one will be poor /starve from HUNGER. Hi!it can be possible for a human to stay without water or food within 3days talking about 70years come on guys?think about!! It is not any miracle to live without food. Once you learn and practice to live more on cosmic energy , requirement of food becomes reduced to very little. Many are there who regular practice long fasting, of course not without water because we are in different word ,where we have to do our daily work also. but its very easy to live without food for a month or more and without any reduction of waight with yoga practices taking direct cosmos energy to our body. Read Autobiography of a Yogi, by Paramhansa yogananda. It is written in the Bible end times such unusual things will happen which will draw people’s attention away from God. So many things are happening in today’s world which upsets people’s mind and brings fear in their hearts. For it is written in the scripture God has not given us the spirit of fear, but of power, love and a sound mind. I am not criticizing this yogi for what situation he is in. But my humble request towards everyone is please accept Jesus before its too late. He died for our sins which shows how much he loves us and rose again on the third day which shows his promises never fail. what u trying to prove????? I believe that if you really believe on whatever you worship, it works for you. This is his gift, he is different and it is real and already he has stayed more than ten days without water and food and he has not been to the toilet, what do you think about that. Daniel, in this world anything is possible. I think this is far beyond your imagination. believe me, it is possible. So we should believe and work to get something similar in small for us, our family and our society. Man don’t be fooled this cannot be happening Dose it means that this man is above the creator who created things for mans consumption ? Thandie swaziland god is not granting all humans wishes, then noone would have to be hungry or suffer. Amit i think you read autobiography of a yogi paramahamsa there it is written of such lady. It may look impossible but i think it is possible. I dont know what he believes in or worships, but if he worships God the Creator of Heaven & Earth it is possible because God grants you whatever you ask for. In my own point of view i think it is possible. It is proved. He was kept under proper observation and he did not drink or eat for 15 days. Its true, this person is different. Dont always discard everything that you cannot prove scientifically. it might be true to an extent doctor’s should keep him under observation for a month or so than only facts would come out since surviving without food or water for 10 – 20 days is quite as many saints practice that but if he challenges than the source of his energy should be studied . When people are surprising to this news, I am astonished. Our ancient Siddha Yogies have enough prof. Humidity in the air is source of water. Sun and cosmic elements in air are survival food. Which is amply available in caves too. @Matt…They’ve already had him in isolation for 8 days dude and a previous study had im in isolation for 10 days, obviously he can live longer than 3-4 days without water… no human can do that. Period. His mind and his life force are very strong… 10 days without water…. wow. I think this is possible.i can live without food and water max 3 days. but it’s really miracle. i love trak.in only because of its focused articles about business and tech…. leave these kind of buzzing news to normal news people.I like to read quality articles from trak.in. He is a natural being who is free of all these materialistic things. May be the secret behind his living is living in his own way just connecting with the nature. He should not be restricted in a room and used for all the experiments and researches by the docs..He must be left free. first of all thank you for providing non-business post.i am fan of your regular post. Many amazing or surprising thing happened in the world and unfortunately experts, doctors,and scientist can’t find root cause.Before some days i have seen in national geography channel that a 12 year old girl had the victim of discharge of blood from all parts of body(including her eyes).and there is no even scratch found after washing blood.but still No doctor found the reason of discharging blood.so there is something which is beyond the imagination of human.if this is real than i may say it must be a miracle. on the other hand, it is pretty funny, and reminds me that I can’t really take anything seriously when it comes to news-sites. I think this is possible. Anything can be made possible with body by using will-power and determination. But according to me, saying him a holy person or worshiping him is wrong. For being holy purity of mind is needed. A lot of such things are also possible through yoga asanas. it’s July and we don’t have any news. What hapen with this men? We imaginate something wherever our brain developed. Miracles hapen all the time, but this seems too extreme to be real. I’ll be interested in seeing how the observations go.